Property Location Located in Greenwood Village, Sleep Inn Denver Tech Center is in the business district and close to Fiddler's Green Amphitheatre and Park Meadows Mall. This hotel is within the vicinity of Kennedy Soccer Complex and Sky Ridge Medical Center. Rooms Make yourself at home in one of the 115 air-conditioned rooms featuring refrigerators and LCD televisions. Complimentary wireless Internet access keeps you connected, and cable programming is available for your entertainment. Private bathrooms with showers feature complimentary toiletries and hair dryers. Conveniences include laptop-compatible safes and desks, as well as phones with free local calls. Amenities Take advantage of recreation opportunities including an indoor pool and a fitness center. Additional features at this hotel include complimentary wireless Internet access, concierge services, and a television in a common area. Dining A complimentary buffet breakfast is included. Business, Other Amenities Featured amenities include a business center, express check-in, and complimentary newspapers in the lobby. Free self parking is available onsite. 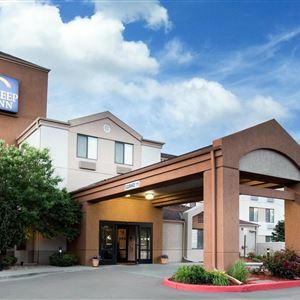 Located in Greenwood Village, Sleep Inn Denver Tech Center is in the business district and close to Fiddler's Green Amphitheatre and Park Meadows Mall. 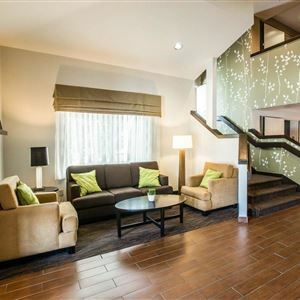 This hotel is within the vicinity of Kennedy Soccer Complex and Sky Ridge Medical Center. Make yourself at home in one of the 115 air-conditioned rooms featuring refrigerators and LCD televisions. Complimentary wireless Internet access keeps you connected, and cable programming is available for your entertainment. Private bathrooms with showers feature complimentary toiletries and hair dryers. Conveniences include laptop-compatible safes and desks, as well as phones with free local calls. Take advantage of recreation opportunities including an indoor pool and a fitness center. Additional features at this hotel include complimentary wireless Internet access, concierge services, and a television in a common area.